An apéritif is served before a meal to stimulate the appetite. Popular apéritifs include, my personal favorite, Pastis, ouzo, vermouth, Campari, fortified wines, and other drinks. Apéritifs are usually also served with a small snack such as cheese and olives. 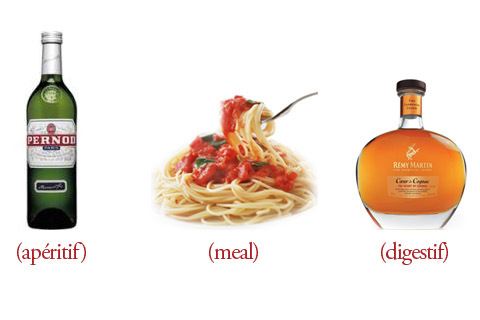 A digestif is taken after a meal. The thought here is that the drink will help to aid in digestion. Some digestifs contain bitters or carminative herbs which are believed traditionally to help one digest. Common digestifs include amari, bitters, port, grappa, sherry, etc. There’s no scientific research currently supporting the idea that digestifs settle the tummy. In my mind they make sense as you normally drink them “neat” (so they’re stronger drinks and therefore sipped slowly). The act of sitting calmly after a meal, slowly sipping a drink, and engaging in pleasant conversation will surely be better than staying with the wines and quickly leaving a restaurant and walking home or hopping in a taxi. So there you have it. Now you know which one comes at which point in the meal and some common types. Now get out there and research your favorite of each so you know what to order when at a fine dining establishment or fancy dinner party. Have a favorite pre or post-meal drink? Let us know in the comments.